New Zealand Shootings: 'Shocked' Rifle Club Revokes Suspect's Membership In the days following Friday's attack, more details are emerging about the alleged gunman. The country's police force believes he acted alone. People on Tuesday stand next to floral tributes placed across the road from the Al Noor Mosque in Christchurch, New Zealand, where dozens of worshippers were gunned down last week. Pete Breidahl, a former member of New Zealand's military, tells NPR he is almost certain he met the accused shooter at Bruce Rifle Club. "There was just something about the guy that terrified me," he says. "There were numerous people that really worried me, but there were a couple of people that terrified me." Breidahl says he believes he saw the suspect hanging out at the shooting club with men who dressed in camouflage and had Confederate flag stickers on their cars and rifle cases. He remembers them discussing the 1996 mass shooting in Port Arthur, Australia, in which nearly three dozen people were killed. He says they recounted how they would have carried it out to maximize casualties. Breidahl says the men at the club called Muslim immigrants "terrorists." "The way these guys spoke — 'Islamophobic' would be one word — and they lived in a bit of a fantasy world," he says. Breidahl says he notified the police about the scene at the rifle club but that the officer shrugged off his concerns. In a statement to NPR, Scott Williams, the vice president of Bruce Rifle Club, confirmed that the accused attacker was a member of the club at the time of the shootings and has since had his membership revoked. "To those Club members who had anything to do with him, he seemed like a normal person and never gave anyone reason to suspect he would carry out an attack like he has," the statement said. "The Club is feeling shocked, stunned, betrayed and used that we've had this person in our Club who has used our facilities to hone his skills to do these horrible things to some innocent human beings." The statement added that the club's executive committee "decided to close our Rifle Range for the foreseeable future." On Monday, Prime Minister Jacinda Ardern said her government will detail changes to the country's gun laws in the next week. Several gun stores and online sellers in New Zealand announced they have pulled military-style semi-automatic firearms from their shelves. Andrew Taylor, an owner of Shooters Supplies, a store in Christchurch that sells firearms and accessories, says he has been receiving many calls since Friday asking to buy semi-automatic weapons. Taylor says he has had to turn down shoppers asking for high-capacity magazines, which enable guns to shoot far more bullets than they are designed for. "Anyone can buy those magazines. They're just not allowed to put them in their gun. But if they do, what can we do?" Taylor says. "So we've pulled the sales of those. And we've pulled the sales of all AR platform guns until we hear further from police or the government as to what we are supposed to do." In contrast to the shoppers, local media have reported that some gun owners have turned over their semi-automatic weapons to the authorities. In a park across the street from the Al Noor Mosque, a man sitting under a tree plays a flute while dozens of residents lay flowers and letters along a perimeter marked by police tape. 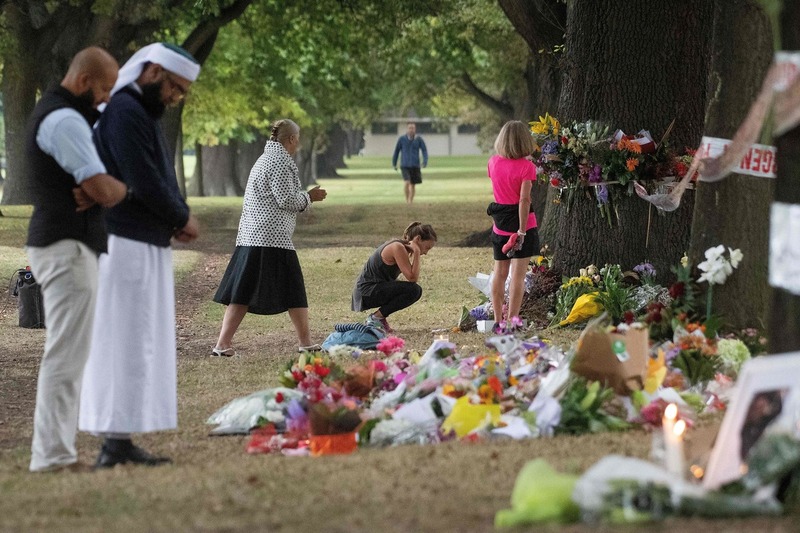 Al Noor and the Linwood mosque in Christchurch are crime scenes — sites of the worst terrorist attack on New Zealand's soil. Hady Osman came from a work trip to San Francisco, rushing home when he learned his friend was killed. "Just the amount of letters and messages from everybody made it very difficult," Osman says. "There's a photo of our friend with a T-shirt signed by our football team. That was very difficult." Abdul Quddush Khan lost three friends, one of whom he grew up with in Fiji many years ago. They both became imams, and his friend was in New Zealand visiting his daughter when he stopped by a mosque in Christchurch to pray — and then was murdered there. Khan flew from Sydney to be with his friends' families. Even though he is a religious leader, he acknowledges feeling powerless to help them through their grief. "So what do we do? We are going to meet the families and talk to them. At least we can share with them, share their grief — that's all. What are we going to do? We can't bring their families back," he says, weeping. "We can't get them back. When I see them, I think of my own children. If this thing happens to me and my family ..."
Just then, Khan's phone rings. He reaches into his robe and takes the call, still crying. It's someone who needs his help. And he is here to do just that.